It was an odd scene at Benito Villamarin Stadium in Seville: The few visiting English fans were chanting “Ole” at every touch of the ball by their squad, while the home Spanish crowd was jeering its own players. It was only halftime on Monday and the Spaniards had already seen their national team concede three goals for the first time ever in a competitive match at home. By the end, they were witnesses to La Roja’s first home loss in 15 years. Raheem Sterling scored twice and Marcus Rashford once in a stunning first half for England, which held on to beat Spain 3-2 in the UEFA Nations League to get back in contention for a spot in the final four of Europe’s newest competition. In the other match in League A, Iceland lost to Switzerland 2-1 and was relegated to the second-tier League B. 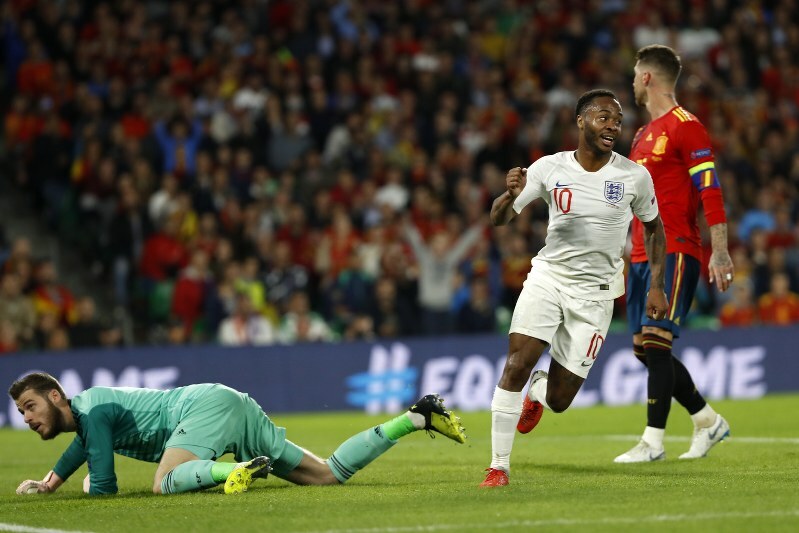 Sterling ended his three-year scoring drought with England with goals on each side of Rashford’s strike before the break, leading England to its first win in Spain since 1987. “For a young team, they put in an incredibly mature performance, withstood pressure reasonably well and should all be really proud,” England coach Gareth Southgate said. Spain suffered its first loss in a competitive match at home since 2003 against Greece. It hadn’t lost at home in 38 matches, and had not conceded three goals in a home match since 1991 in a friendly against Hungary. Paco Alcacer scored Spain’s first goal early in the second half and Sergio Ramos claimed the second on the final play of the match. Despite the loss, Spain stayed ahead in Group 4 of League A with two more points than England after three matches. Croatia, with a game in hand, was five points behind Spain. Spain could have secured a spot in the last four with a win, while a draw would have ended England’s chances of advancing. Only the group winner moves on. Spain started well but its high defensive line struggled against the speed of England’s young forwards. The visitors were clinical, scoring on all of their attempts on goal. Spain totaled 25 attempts and 70 percent of possession, and blew it. England opened the scoring early in a fast breakaway. Rashford sent a nice ball into space for Sterling, who entered the area with only the goalkeeper to beat and found the top of the net with a superb finish. It was his first goal for England since 2015, and first ever away from Wembley. Rashford added to the lead in the 30th after a perfect through ball by Kane, entering the area and finishing with a shot from near the penalty spot. Sterling got on the board again from close range after Kane’s set-up in a move which started with a nice pass by Ross Barkley over the top of the Spanish defenders. Spain got on the board in the 58th through a header by substitute striker Alcacer, who has 10 goals in his last six games with club and country. Ramos’ last-minute goal also was a header. Iceland needed to beat Switzerland for the first time to avoid relegation but the Swiss got off to a two-goal lead and held on to victory. Switzerland routed Iceland 6-0 at home in the team’s opener. It moved into a tie with Belgium for first place in Group 2. The Belgians have a game in hand. In League B, Bosnia-Herzegovina defeated Northern Ireland 2-1 at home to take a six-point lead over Austria atop Group 3. In Group 2 of League C, Finland beat Greece 2-0 at home to remain perfect with four wins and a clean sheet after four matches. Estonia and Hungary drew 3-3 in the group’s other match. Luxembourg defeated San Marino 3-0 to take the lead in Group 2 of League D, ahead of Belarus, which was held by Moldova to 0-0.